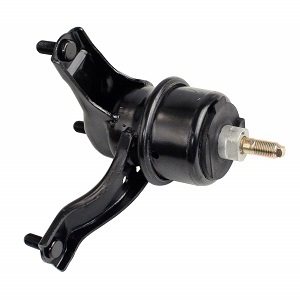 Click here to find engine mounts for your vehicle. Motor mounts can be thought of as shock absorbers for your engine, and as such, motor mounts are critical components for the reduction of noise and vibration in passenger vehicles. Motor mounts can be designed with different priorities in mind. Specifically, motor mounts can be soft to mitigate as much vibration as possible such as in luxury vehicles, or they can be firm in instances where vibration is less of a concern such as in performance vehicles. While the primary function of motor mounts (which are also known as engine mounts) is to mount the engine and transmission to the frame of a vehicle, motor mounts also contain or limit counter-torque movements when the engine develops power while absorbing and damping out engine vibrations at the same time. As a practical matter, engine mounts have to be flexible enough to prevent engine vibrations from being transmitted to the vehicle frame, while being strong and durable enough to support the weight of the engine for at least several years of normal driving. In its simplest form, an engine mount consists of two metal parts and a formed rubber insert that separates the two metal components. In terms of operation, each of the two metal components attaches to the engine and the vehicle frame, respectively, while the flexible rubber insert supports the weight of the engine and absorbs engine vibrations while allowing some relative movement between the engine and the vehicle frame. However, increasing demands for comfort and reductions in noise and vibration on modern vehicles have led to the development of new and more effective vibration-damping materials. Typical examples include nitrogen filled and oil filled rubber inserts that are at least several times more effective in damping out engine vibrations than even the best solid rubber insert mounts. Current trends in motor mount design also include active vibration damping. In these designs, the mount is fitted with a sensor that senses vibration information in real time. This information is then relayed to a dedicated control module that uses an actuator built into the mount to generate out-of-phase vibrations of the exact frequency and amplitude that dampen (cancel out) engine vibrations. The practical advantages of active mounts include the extremely effective damping of engine vibrations, as well as the fact that the control module can induce “counter” vibrations individually in each mount to counter engine vibrations that change throughout the engine’s operating range, depending on the engine speed and load at any given moment. The obvious downside to this type of mount is that they are significantly more expensive than passive motor mounts. Typical noises include thumping, clanking, or knocking noises that typically occur during acceleration or gear changes. This is the result of the two metal parts of the mount coming into contact with each other when the rubber insert has failed, or is in the process of failing. Note that contact with engine oil is a major cause of inserts failing, since engine oil can degrade rubber depending on the compound. In cases where the rubber insert in a mount has failed completely, the metal parts of the mount may be in permanent contact with each other, thus transmitting engine vibrations to the vehicle’s frame directly. In some transversely mounted engines (typically found in front wheel drive cars), one or more failed engine mounts can place undue strain on mechanical gearshift linkages, thus making it difficult to change gears on manual transmissions, or to move the gear selector on automatic transmissions. For motor mounts that are oil filled or otherwise hydraulic in nature, you will occasionally see fluid dripping from the bottom of the mount within your engine bay. Rarely, there will be enough fluid for it to be noticeable on the ground beneath the vehicle. Replacing motor mounts can vary from being relatively easy to being extremely challenging even for professional technicians, depending on the application (FWD or RWD vehicles), the type of mount, and where the failed mount is located. Motor mounts often fail in multiples, so they are often replaced at the same time. This is because the other motor mounts take more load once one mount has failed, so once a mount has failed, the others often follow shortly thereafter. Note: The example steps below are intended for general informational purposes solely to help give you an idea of project difficulty and tools required. As all cars are engineered differently, repair procedures and safety hazards vary from vehicle to vehicle. To ensure that you have a vehicle specific repair procedure and an exhaustive list of potential safety hazards, we advise you reference a factory service manual for your vehicle. Similarly, referencing a repair manual such as Chilton or Haynes might serve as a less expensive alternative. Step 1 – Place the vehicle on a solid and level surface, and apply the parking brake. Lift the vehicle off the ground with a sturdy floor jack, and use jack stands to support the vehicle safely. Remove all splashguards and cosmetic engine covers necessary to gain full and easy access to the engine mount in question. Step 2 – Identify the defective engine mount(s) and spend at least a few minutes studying the general layout of the engine/transmission combination. Specifically, you’ll want to understand how and where the engine and transmission are attached to the vehicle frame. Note the location and attachment points of all cross members, as well as the routing of the exhaust system, A/C lines/hoses, power steering hoses, wiring, and gearshift linkages. The object of this exercise is to formulate a “plan of attack” that will get the job done in the least amount of time by not unnecessarily removing components that do not need to be removed. An inspection mirror is a convenience that can save you a few climbs underneath the vehicle and can help you see mounts that aren’t easily visible from the top of the engine compartment. Step 3 – If more than one mount is to be replaced, replace them one at a time, starting with the one that is the easiest to remove and replace, but be sure to use the floor jack to support the weight of the engine before you start to unscrew retaining bolts. However, also be sure to use a piece of wood or other material spread the pressure from the floor jack on the engine to prevent damage to the oil pan or other parts of the engine. Step 4 – Replacing the easiest mount first provides added support to the engine when you engage the more difficult mount. Note that in some cases, you may have to slack off the retaining bolts on all the other mounts to provide enough movement of the engine so that you can remove a mount. You can do this using a set of combination wrenches, a set of ratcheting wrenches, or a good mechanic’s tool set. You may find that some of the fasteners are torqued very tightly. An impact wrench is usually too big to access engine mount bolts, so won’t be of much use in this particular case. However, a breaker bar may come in handy to break bolts loose and a set of deep sockets with socket extensions may give you an advantage when it comes to accessing the fasteners on your motor mounts. Step 5 – Apart from having replaced the defective mounts, the most critical step in this procedure involves making sure that you have inserted all fasteners in their correct positions, and that all fasteners are torqued down to their recommended torque settings using a calibrated torque wrench. Failing to do this could result not only in premature failure of the newly replaced mounts, but in damage to other components as well, including drive shafts, drive shaft seals, and gear shift linkages, among others. If you have replaced active mounts, make sure all electrical connectors are properly engaged, and that all wiring is properly secured and routed away from hot exhaust parts. Step 6 – Once you are certain that all fasteners are present and properly torqued down, lower the vehicle to the ground and test-drive cautiously to verify the repair. Westar is widely regarded as the market leader in the design, manufacture, and supply of active engine mounts not only for the OEM market, but also for the aftermarket. All Westar mounts are often the exact equivalents for OEM equipment in terms of both fit and function, and are constructed of specially designed steels and rubber compounds to ensure reliable service and operation. Overall, Westar makes a solid engine mount and it’s hard to go wrong with them. Click here to find Westar motor mounts for your vehicle. Most DEA engine mounts are designed and engineered to be direct replacements for OEM equipment. DEA’s mounts are also subjected to extensive testing and quality control, which is why DEA products come with a one-year warranty against defects in both materials and workmanship. DEA engine mounts work well and are designed to withstand the test of time, meaning you won’t have to repeat a project due to a failed part anytime soon. Overall, we are confident that you will be satisfied with a DEA mount. Click here to find DEA motor mounts for your vehicle. Beck/Arnley specializes mainly in the sourcing and distribution of all types of mounts for many imported vehicles. Nonetheless, Beck/Arnley products are typically direct fit replacements for OEM equipment. Their products often also come with all required hardware which is a nice convenience. Beck/Arnley is well known for making high quality engine mounts for imported vehicles, so whether you drive a BMW, Honda, or Alfa Romeo, they will have a reliable engine mount that will last a long time for your vehicle. Click here to find Beck/Arnley motor mounts for your vehicle. Disclaimer: The materials contained on this website are provided for general information purposes only and do not constitute professional advice on any subject matter. Working on vehicles is inherently dangerous; precautions must always be taken to avoid the many safety hazards present including but not limited to fire hazards, electrical hazards, chemical hazards, and a large variety of physical hazards. Always wear appropriate protective gear, always use common sense, always completely understand the task at hand, always understand your equipment and its limitations, stay ever vigilant, and always be safe. If ever in doubt, stop immediately and contact a professional mechanic.